Music is a dramatic art. It is about movement: movement through time, through harmonic spaces, through emotional states. Music articulates the undercurrent of emotion and drama, reinforces characters, and helps propel a story. This is “Comet Dance” from the album Interstellar Cabaret. Both these tracks were built from materials that NASA uploaded to SoundCloud. This is a neat music-theory paper about cadences in film music. When you use an guest operating system in VirtualBox, you create two kinds of assets: virtual machines (VM) and virtual disks (VDI). Virtual Machines, typically with the file extension *.vbox, contain information about CPUs, memory, network & sound cards, etc, while virtual disks contain the actual guest operating system. You can store and move VMs independently of VDIs — you can store all your VMs in one directory and all your VDIs in another, and then you can change your mind and start moving things around. And this “moving things around” is where the trouble starts. VirtualBox creates a unique identifying number (UUID) for every a VM or VDI it creates, and it remembers where that asset is located. If you move a VM or VDI with Finder or Explorer, VirtualBox gets confused and will give you a UUID error when you try to use the VM or VDI in its new location. 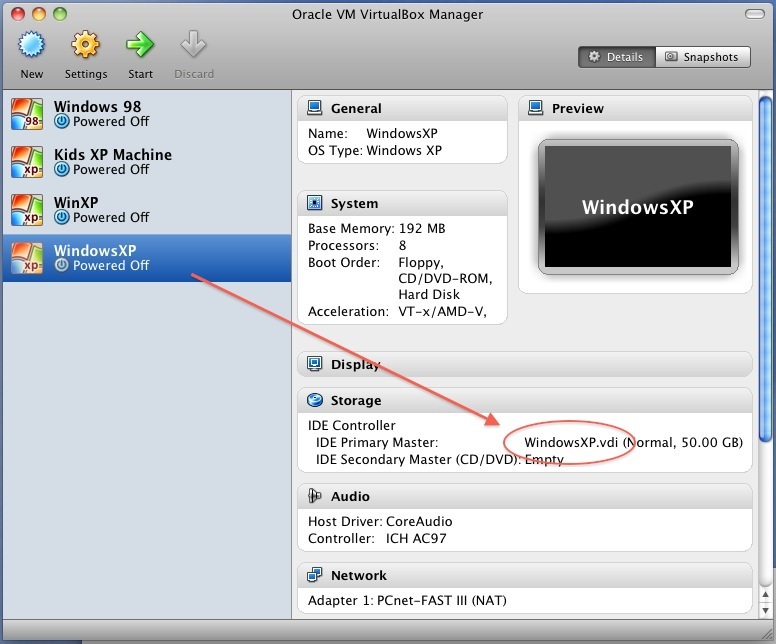 There are several ways to move a VirtualBox VM and/or VDI. Many descriptions require that you edit the XML files where the UUIDs are stored to avoid getting a UUID error. There a much easier way. The drive that my VDI is on is getting crowded, and I want to move the VirtualDisk to a different drive. And while I am at it, I want the Virtual Machine (VM) that uses that virtual disk (VDI) to be in the same location as the VDI. I am using VirtualBox 4.1.20 on a Mac Host. To move a Virtual Machine, you start by opening the VirtualBox Manager. This GUI handles the information about each VM. It does not manage the virtual disks, only the virtual machines that use the disks. 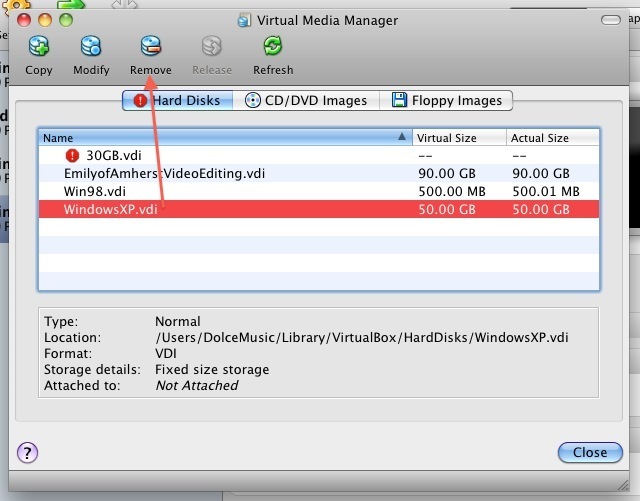 To manage the disks, you use the Virtual Media Manager. We will get to that later. I want to move the VM called WindowsXP (selected in blue in the following image). I recently had the experience of being unable to find the VM I wanted to move, because I had forgotten this step and my naming strategy was poorly planned. I had several old VMs with the same name that I had long ago removed from VirtualBox but failed to delete. Now that you know where your VM is, you can remove it from VirtualBox’s records. 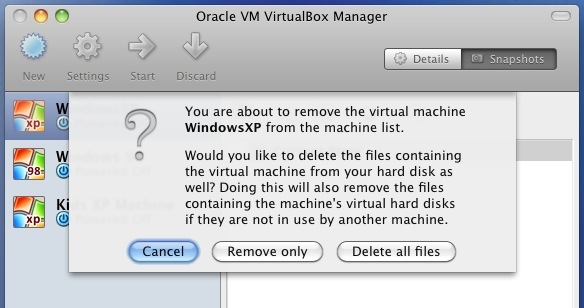 You will only remove VirtualBox’s knowledge of the VM, you will not remove the VM itself. Clicking “Remove only” will delete information about the Virtual Machine (VM) from VirtualBox Manager, but it will not delete the machine itself. Clicking “Delete all files” WILL delete the entire VM folder from your host computer. Now go back to the directory that contains your VM folder. My VM is “WindowsXP.vbox” and it is stored in the directory /Users/DolceMusic/VirtualBox/WindowsXP. So I go to /Users/DolceMusic/VirtualBox and drag the folder “WindowsXP” to its new location. Because VirtualBox no longer has any knowledge of this VM, you will not get a UUID error. 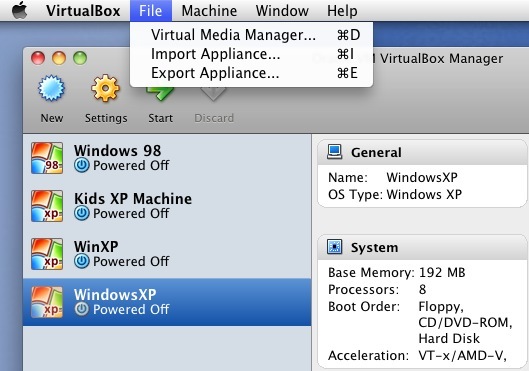 Now that your VM is in its new location, you need to let VirtualBox Manager know about it. Go to the menu called “Machine” and select the item “Add…” (see image below). Select the machine you want to add, and click the “Open” button (or press Return). You VM is now ready to go in its new location. The VDI that contains the guest operating system, however, is still in its original location. To move that, you will go through steps analogous to what you did to move the VM — you will remove the record of your VDI from VirtualBox, move the VDI file, and then add the VDI back to VirtualBox from its now location. Before you move the VDI, you want to be certain which VDI you need to move. When you select a virtual machine in VirtualBox Manager, you will see a lot of information about that VM, including the drives that it uses. and you will be taken to the following screen. Hold your mouse over the name of the VDI, and an info popup will tell you the path to that VDI. Now you need to detach the VDI from any virtual machines that use it. 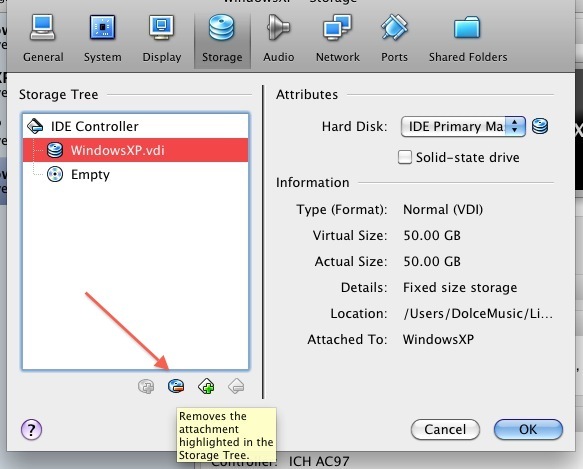 Select the VDI under the IDE Controller tree and click the button with the minus sign, and then click OK.
You have now told the VMs to forget all about the VDI, now you have to tell VirtualBox itself to forget about it. Select the drive you want to remove, and click the “Remove” button. I want to move the VDI, so I select “Keep.” The VDI is now a non-entity as far as VirtualBox is concerned, so you can move/rename to your heart’s content. I want my VDI in the same directory as the VM that uses it, so I move it there. After the VDI has completed its move, you need to tell VirtualBox about it again. Use your file manager to find the VDI file and drag it to the Virtual Media Manager. That’s it. Now you must reattach the VDI to the VM that uses it. Close Virtual Media Manager to return to VirtualBox Manager. Select that VM that uses the VDI, and click the label that says “Storage” (the same place you went to Remove the VDI as described a few lines above). You will have the option of creating a new disk or opening an existing one. Select Open and Existing One, find the VDI you want to add, click OK, and your VM is ready to go. If you are producing a film or theater piece and you are not also the director, you need to do your best, before you start, to figure out who is the final arbiter of what the look and feel of the project is. Otherwise you risk adding to the expense of the project and the frustration level of the artists working with you, not to mention your own frustration. Some years ago a director, with whom I had collaborated many times, was beginning a new project. For the first time the director had brought on a producing partner. The director and I had many conversations that went like this, “My partner wants something that sounds like this,” and I would be sent a sample of music. I would produce something that the director and I both thought fit the requirements, and then we got the producer’s opinion. The next day or so I got the news, “My producer doesn’t like it. It should be more like this,” and I would get another sample. This cycle went on for several more repetitions, and each time the director, getting increasingly exasperated, would say to me, “I keep telling the producer that your music is exactly what he said he wanted, and he keeps saying it isn’t right.” Eventually, the producer decided to go in an entirely different direction, and I was no longer involved with the project. I was hired to write some music for a documentary. The director said that he had been assured by the producer that he, the director, had total creative control. The director and I started to collaborate – we talked about what he wanted the music to be, I sent him samples, he gave me feedback, and over the next few weeks I scored the film. When we showed the film to the producing team, they started giving feedback about what should be changed and what they wanted the music to sound like. I was puzzled; the production team was behaving as if it thought it was hearing a first drift, and the team members were telling me what needed to be changed. I, meanwhile, thought I was showing the final product. All the tweaking I had done with the director was for naught, and I was back to square one. When the executive producer let the director have creative control, the Executive Director was being sincere; the producers just didn’t realize what that really meant. It was the first film they had made, and perhaps they did not fully appreciate the extent of the detail of their own vision. The producers had conveyed their thoughts and broad goals to the director, and the director did his best to bring in to being what he understood the producers’ visions to be. As the producers came to appreciate the significant impact that subtle differences in music, lighting, etc. can have on the final product, they came to understand that they did, indeed, want to have lots of input into the details of the project. When the director and the producers recognized how much input the producers really wanted to have, the director took himself out of the process. (The filming was complete and the editing was mostly done). I then spent two additional weeks working with the producers to create an entirely new soundtrack. The director and the producer need to come to a solid understanding of how each is going to be involved in the making of artistic decisions before the project starts, and the members of the crew need to know who they should be keeping happy. The producers in my second example, as it was their first film, did not have the experience to know the extant to which making a film is a process of moving lots of little pieces in one direction one piece at a time. Making a movie is not like sliding a box full of 1000 checkers along a counter; it’s like sliding 1000 checkers, one at time, one inch at a time, along a counter. Somebody has to decide how the pieces get moved, how far, and in what order. Woody Allen’s producers, Jack Rollins and Charles Joffe, say that very early on they learned that the way to produce a successful Woody Allen movie was to give him the money and get out of the way. Most producers are not like that — they have a particular vision and they want to be part of the artistic process. The director also has a vision and wants to be part of the artistic process. I love the collaborative process — it can produce great results — but the members of the team need to know whose opinion and instruction tops whose. Or is it truly a collaboration built on consensus. If the producers and the director fail to come to an understanding very early one, the crew is likely to be caught in the dilemma of having to serve two masters — “The director wants earth tones, but the producer wants neon. How do I reconcile that? !” Such a conflict can breed frustration and cost money — in the above examples it took me at least twice as long to create the music than it would have if the decision-making chain had been clear at the outset. As you begin a project it can be very easy, in your rush of inspiration, to overlook the importance of labeling your regions. At first it might not seem important; you know everything that is in your arrangement. The next day or week, however, as your work grows and that handful of regions becomes hundreds, it will become harder and harder to navigate your project without labels that make sense. assign markers to particular ranges of you project. Today, I am going to discuss assigning colors. You can assign colors to tracks or individual regions. By default, any new region will take the color assigned to the track. There is no right way to determine what regions get what colors. I give bass regions dark colors. I give yellows to the wind instruments — the higher the range, the lighter the color. I give earth tone reds to the strings. The colors you assign with depend on your needs and taste. You might also assign colors based on the purpose of the regions — regions of red go with the fight scene, for instance. A track’s color determines the default color of any new region created in that track. To see the tracks’ default colors, right-click in any Track Header, and the following menu pops up. Select “Configure Track Header,” and the following Track Header Configuration options pane appears. At the bottom of the Track Header Configuration box you will see a check box labelled “Track Color Bars.” Selecting this box will cause thin color bars to display at the right edge of the Track Header. The color bars indicated by the red circle and arrow are the tracks’ default colors. Changing a track’s color is easy, but not obvious. Select “Colors” from the “View” menu, and the color pallet appears. The color palette is floating; you can put it wherever you want. When the palette is open, changing the color of a track or region is very simple. Select the track or region whose color you want to change. Select the new color you want from the color palette. You can select multiple regions to give them all the same color simultaneously. I just delivered some more music for the news department at NEPR / WFCR 88.5. Congratulations! You have Creative’s Zen, and if your experience has been anything like mine, you have, by now, discovered that while the player is a nice little machine, the software really stinks and Creative’s support is not much better. Particularly unpleasant is the challenge of converting videos for use on the Zen. After much experimenting, I have discovered a free, fairly-straight forward solution for producing a video that will play on a Zen. Step 2: Get a video file you want to put on the Zen. When you open SUPER, you have many options. The crucial options are pointed out in the following image. The bitrate of your video and audio is not so crucial, so you can play around with that. You can right-click anywhere in the SUPER window to get a large menu of options. One of the options is “Output File Saving Management.” Use that option to specify where you want your converted files to be saved. From that same menu you can choose “Export (Save) a SUPER “Settings Profile.”” This will save some of the options you have selected, but it will not save the options you choose on the screen that follows (see below), so I suggest that you write down, and put in a safe place, the exact settings described here. More than once I have figured out successful settings, used them, then, a few months later, forgotten what I did. That is why I have written this post. After you have dragged the files you want to convert to SUPER and selected your options, click the button near the bottom left that says “Encode (Active Files).” Be patient for a few seconds, after which time the following screen will appear. Select the options indicated by the arrows, then click the big “OK” button. After SUPER has finished you SHOULD have files that you can drag to the Video folder on your Zen. 1) These settings work for me. If you have problems, please let me know. I am by no means an expert in this stuff, but I do like learning more. 2) These are not the only settings that will work. They might not even be the best (see above about me not being an expert). If you know of other settings that might produce smaller files or better quality files, please feel free to share. I was just looking for something that worked, and this is what I found. The CD of the music of the ballet is to be released soon. It is supposed to be delivered by Thursday, but you can hear some selections now. It has been a busy several weeks. Dealing with recording, scheduling, click-tracks, getting music and voices recorded, fixing pitch and other glitches, over-dubbing, synching, mixing, etc. You know the drill. But we are mostly done with the music as we enter the final week of rehearsals. Mostly done?! Shouldn’t you be entirely done? you ask. Yes, but we have three versions of one dance, and the dancers need to decide which one they want. I hope they do that soon. I must say, it has been really fun working on this project. It has given me a much better understanding of Emily Dickinson the person. While she was a very private person, she had a delightful sense of humor, and the people who knew her intimately must have been very lucky indeed. Now, as long as Swine Flu fears doesn’t close down the theater, we will have a great show. We are rounding the bend on the ballet. There are a few more scenes to go, and I am writing about three minutes of music a day. While it is a bit tiring, I am having fun. It is also revitalizing to see that the “Done” pile is now bigger than the “To-Do” pile. I need to have the music locked by the end of March. Holy Smokes! I just realized how soon that is! Well, back to work. So when will I have time to do my taxes?